We have been in business for 14 years designing, manufacturing and installing water production systems in residential and commercial applications. We have several examples of our products here for you to read about. 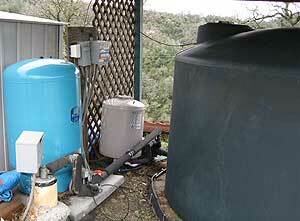 In the Fall of 2005 we were contacted by a customer who had a problem with inadequate water supply. The problem first showed up when they had several water faucets running at the same time. The water pressure would gradually drop off to 10-15 pounds of water pressure. They had contacted a local well driller who came and checked out their well system and found that the well needed to be replaced with a completely new one ( big surprise there) They thought that this would end their problems. After 2 weeks of construction and a yard full of mud , they had a new well, new pump, new tank, wiring and plumbing to the house. Their total bill from the plumber, electrician and well driller was $11825.00. The only problem with their new water supply was that the new well's water had a odor of sulfur in it and it smelled like rotten eggs. They had a new well that provided over 20 gallons per minute that had been drilled into a large underwater aquifer that had sulfur in it. We were contacted to try to solve their problem. We suggested that we would install our Well Booster® Pro on their original well since they had such good quality water from it ( just not enough of it ) We installed our Well Booster® Pro along with our 400 gallon storage tank into their pump house. They now have enough water for every thing that they ever wanted. Their original well produces over 4.5 gallons per minute ( which is a lot less then their new well which produced 20 gallons per minute ) but with the Well Booster® Pro installed, they are enjoying up to 6400 gallons of good clean water ( with no smelly sulfur in it) per day. Obviously this much water isn't usually needed for a family of 4 and a normal sized yard, but it shows what can be obtained. In Northern California we where contracted to help out with a problem at a property that had multiple water wells on it. Their problem was that they where located in a foothill area that was notorious for low production wells. The average well in the area was only 1/2 to 1 gallons per hour! They have 5 wells that each produce about 1 gallon per hour. They had Coyote pump protectors on all of the 5 wells. ( Coyote pump protectors are designed to shut off the pump if your well runs low or out of water) They needed enough water to irrigate 15 acres of grapes, 3 acres of olives and 1/2 acre of lawn. The grapes and olives didn't require too much water ( with drip irrigation on all) But the lawns did use a lot of water every day. The problem was that they had their 5 well pumps set to run continuously until each of the well pumps either filled up their 10,000 gallon tanks , or ran out of water and hopefully the Coyote pump protectors would shut off the well pumps so they wouldn't burn themselves up. After 4 well pumps had burned up over 2 years at over $900 dollars each, they gave us a call. Their 5 wells have a combined recharge rate of over 7200 gallons per 24 hour period. They weren't getting even close to that number of gallons (only about 3000 gallons). They were going to get a large increase of water production with one of our Well Booster® Pro installed. Our system operates on a principal of using all of the available time in a day ( 1440 minutes ) for collecting water and storing it for later use. You don't want your pump protector ( Coyote , Pumptec etc.) to control your well pump. It allows your well pump to pump the well water dry every time that the well pump comes on with a low yield well and with a built in reset function it comes back on in 15-60 minutes. The other problem is that when you pump a well dry it is very bad for the life of the well. The minerals in the ground and in the water when exposed to air ( from the well being dry ) will build up and eventually clog the microscopic pores and openings of the water producing ground. It is much better to have a regulated amount of water removed from the well allowing the water level in your well to remain at a safe level. This practice also allows the well pumps to last many more years being submerged in water the whole time. The well pumps get their motors cooled by the water being pulled across the motor when the pump is running. So when the well runs out of water and the pump protector shuts it off , it has been running without an adequate supply of water cooling the motor for quite a while too. This radically shortens the life of your well pump. In October 2006 we were contacted about a newly constructed 1500 square foot residence with a 1 gallon per minute low yield well. They needed enough water for a family of 3 and to keep a small yard and lawn watered, a hot tub filled and also a swimming pool topped off when needed. By our calculations this amounted to an average of approximately 1100 gallons per day. When their well driller had installed their well (6 months before) they had put in a Pumptec pump protector that was set to recover at 45 minutes after shutting off due to no water in the low yield well conditions. The home owners didn't understand that their was a problem with this system as it had already worked for several months. When we actually figured out how much water their set up produced in a 24 hour period, and they were about 450 gallons short of their daily goal, plus the wasted electricity! 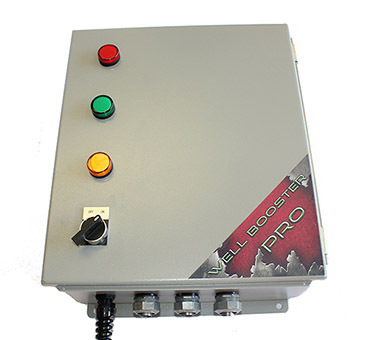 We felt that that their goal could be obtained with the use of our Well Booster® Pro. By using their existing submersible well pump, 1500 gallon storage tank, pressure tank and booster pump we installed our Well Booster® Pro. It was an easy installation since we installed it in conjunction with their existing well pumps and tanks. It took about 3 hours to mount and for the electrical wiring to be finished. The time-on setting was set for a moderate 30 minute rest and 10 minute pump time. This produced a very satisfactory 1200 gallons per day. 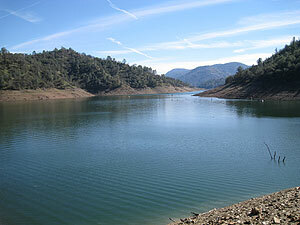 In Sept of 2007 we started a low yield water well project in Northern California in the Sierra Foothills about 20 miles from Yosemite that was located right next to a lake. How could you possible have a low yield well right next to a lake? Good question. These poor people had a 1200 foot deep well ( the deepest in the county ) that only produced 1/2 of a gallon of water per minute. It was in a rocky elevated area that required drilling through shale and granite rock all the way down to the water. Needless to say, they had a severe need for a solution to their constant problem of running out of water. Their first well cost $15000.00, so drilling another well was out of the question. We knew that our system would be the easiest and least expensive way to solve their problem. We installed our Ultimate Well Booster Pro with our upgraded 1500 gallon storage tank. Their 1/2 gallon per minute well produced over 700 gallons of water per day with our system installed. This system now allows the family of 4 to do everything (including fill their hot tub with 500 gallons at a time) without ever worrying about running out of water. Please read our terms and conditions before ordering.